According to the Government of Ontario, more than 12,000 people end up in the hospital each year due to cold and flu season. About 3,500 don’t ever come out. What this points to is that the flu, in particular, can be deadly, especially in high-risk populations such as children and the elderly. Of course, you don’t go into cold and flu season thinking that this year you might be the one who ends up in the emergency room. But it happens. Every year, people who never expected to get that sick do, and for many, it is precisely the lack of expectation that allows the flu to sneak up on them. In this post, we share some of our favorite tips for how to stay healthy by learning to control your indoor “weather” at home and work. With the right combination of temperature, fresh air, and humidity, you can give your immune system that extra push to repel germs all winter long. 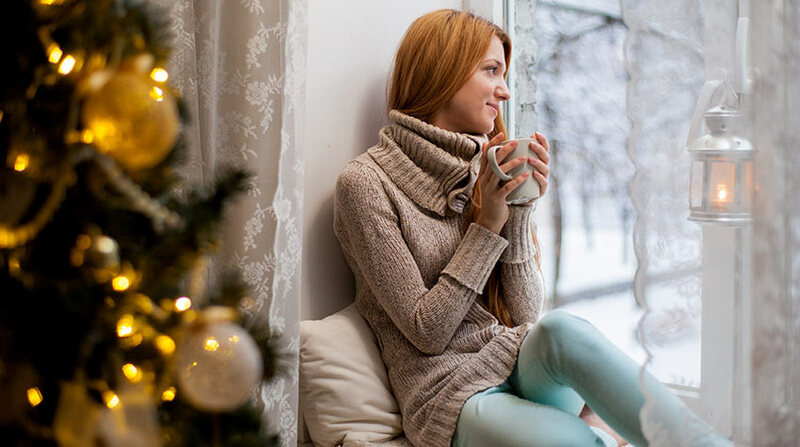 There are three major elements that go into controlling your indoor weather to support better health in wintertime. When it comes to setting your temperature, you want to aim for a range between 20°C (68°F) to 24°C (75°F). You can go lower if no one in your household is ill or falls in the high-risk population (compromised immune system, very young, elderly, pregnant, indigenous). This temperature range factors in the addition of clothing, shoes, heated floors and other helps that all together keep the typical person near or at their normal body temperature of 37°C (98.6°F). It won’t stress out your immune system due to continually moving between one micro-climate to another. It will help stabilize your blood pressure (which will naturally rise in unstable temperature conditions). It will discourage germs and microbes from settling in and multiplying in certain areas. Winter brings lower humidity levels with cooler, drier air. This is part of the reason that cold and flu season is associated with winter—the germs that cause cold and flu thrive in cool, dry air. So here, one key element of keeping those germs at bay is to maintain a baseline humidity of 30 to 50 percent in your indoor air at home and at work. Go lower than 30 percent and say hello to multiplying germs. Go higher than 50 percent and warm weather moulds and mildews can move back in. Keeping your indoor air fresh and pure at home and at work is absolutely a factor in reducing the risk of contracting colds or the flu. But here, cold drafts are not helpful. Actually, they can lead to elevated blood pressure (see “Temperature” here), which triggers your body’s stress response and weakens the immune system. So keep air continually circulating to expel stale, germ-laden air and draw in new, fresh, clean air, but also keep the indoor environment free from drafts. Your goal in optimizing these three elements is to make sure temperature is not an issue at home and at work. In other words, for most people, a surrounding temperature that permits maintenance of a body temperature at or close to 37°C (98.6°F) is ideal for both health and comfort. Thankfully, the air quality industry has come a long way over the last few decades. Today we have an entire range of helps that can make stabilizing your indoor weather easy and automatic. The heat recovery ventilator. This handy appliance ensures your outgoing stale air and your incoming fresh air will never meet and mix. The whole-home flow-through humidifier. This great appliance equalizes air flow pressure to evenly spread moisture throughout your home or workspace, creating air with optimal humidity levels to maintain health. The HEPA air filtration system. HEPA stands for “high efficiency particulate air” and translates to mean that 99.97 percent of airborne toxins will be filtered out of your indoor air. The whole-home air purifier system. A whole-home air purification system eradicates mildew, mould, germs, bacteria, viruses, fungi, and other contaminants from your indoor air. Duct cleaning. Of course, no amount of balancing and equalizing will achieve your goal if your indoor air ducts are packed with trapped toxins, allergens, and debris. An air duct cleaning will vacuum out all traces of these trapped toxins, resetting your air purity to the highest level. Now is the ideal time to begin working to stabilize, equalize, and purify your indoor air. In most areas, the weather is still bordering on fall temperatures, which means cold and flu season hasn’t hit in earnest yet. As well, the start of the winter holidays is still a few weeks away, which gives you some breathing room to do winter maintenance and preparation for your family, employees, and guests. Here at Clean Air Solutions Hamilton, we are standing by to assist you with our air quality and purity expertise so you can stay healthy all winter long! Contact us at 905-544-2470 or visit us online.